The air humidity is adjusted with high precision in order to provide the desired comfort in the room. It features a new steam nozzle for optimum and balanced humidity setting from 40 to 80 %. 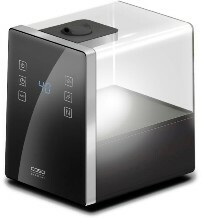 It has ionizer function to purify the air, it operates with tap water in a tank of 6 liters. It has an elegant panel of stainless steel, sensor touch, and anti-scale filter. Its function is of variable vapor volume (high - medium - low level). It has an opening of 360 ° for the steam production. Available for areas up to 100m³. With infrared remote control.